Sometimes Video/Youtube marketing is considered superior to blogging & non-video social media marketing because statistics show that people like to see the videos instead of reading the entire article. Also while blogs might face serious issues of traffic decline in future due to huge growth in social media, Youtube is said to have never ending growth. Starting a Youtube channel is a great idea to build your brand and make money. People who start Youtube channel for passion instantly smell success compared to others who want their wallets to be filled from the next day. To start a Youtube channel all you need is a Google account. Youtube is very strict about the copyright policy. So, if you try to / plan to copy others videos your account might be suspended by the Youtube. 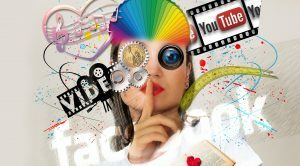 If you’re planning to monetize the videos of your Youtube channel, the content guidelines must be followed. Failing will result in account suspension & Youtube partnership program will be canceled. Videos with misleading content and meta details are not eligible to be monetized. When you’ve decided to start a Youtube channel, the question to raise is “What videos to make?”. Before starting a Youtube channel the first step is to analyze what will I put on my channel. The content is the king and poor quality content will not be viewed for not more than a few seconds. Choose a niche/category about which you’re going to create videos. Know your audience base before selecting the category to target the audience. Here are some of the best performing Youtube video categories – current affairs(top), movie reviews, funny videos, prank videos, tech videos, tutorials, fitness, sports, product reviews, Gaming channel, TV shows, short films, smartphones, Computers, adventure etc. Do not go with the Adult content, illegal usage of Softwares & games, dangerous activities, hate & abusive speech because advertisers do not prefer to advertise their products & services on such videos. After choosing a niche, now it’s time to choose a name for the channel. To become a successful Youtuber, you must brand your channel name. Visitors must remember the channel name in order to return. For example ‘Facebook’ is a brand and ‘Social media’ is a generic name. After choosing the niche and brand name, start making videos. Make the videos professional and the voice clear without noise. Videos with voiceover are preferred over voiceless videos especially in the case of tutorial videos. Create a small introduction clip for your brand and bind it on the front part of the video. If you need help on making voiceovers & video editing you can buy them for just $5 on the Fiverr. When the first video is complete, you’re ready to start a Youtube channel. Youtube allows uploading videos below 100MB, so make use of the video compressing Softwares such as handbrake to reduce the size of the videos. Also, you must verify your phone number in order to upload videos with runtime length above 15 minutes and set custom thumbnails. Create a new Google account or log into your existing Google account. Go to Youtube and click My channel to start a Youtube channel. You will be asked to enter the name of the channel. After entering the name, click on create channel button. Now the channel dashboard will be displayed as shown below. Upload a professional profile picture/logo for the channel and add the channel art. If you are not confident in designing the pictures You can approach Fiverr, where a lot of professional will be available to do it for just $5. Upload your first video to your channel. Continue to add more videos on the daily basis and create the playlist for the visitors. Then after concentrate to build traffic and subscribers. With at least 1000 views/day consider monetising the videos. Speaking about making money on Youtube, the Youtube partner program is the main choice of the Youtubers. The pro-Youtubers go with other better options such as affiliate marketing, direct video ads, and direct banner ads. The monetization methods are explained below in detail. Youtube partner program is the primary choice of the Youtubers which is simple and easy to implement. In simple, Youtube partner program is associated with Google’s ad publishing program Google Adsense. Google Adsense is the online advertisement platform which connects Advertisers to the webmasters, Youtubers, bloggers, etc. The Google Adsense publishers / Youtube partners are eligible to monetize their blog(s), Youtube videos. When the videos are monetized, the targeted ads will be displayed when someone watches the video. The partner will be paid when the visitor interacts with the ad which includes impressions, clicks, active views. The revenue from the advertising is shared by the publishers and Youtube. 55% of the revenue generated by the video will be added to the publisher’s account and 45% is shared with Youtube. So, if the publisher videos generate $100 from the ad interaction(s), $55 will go to the publisher and $45 will be taken by Youtube. This process is automatic and done instantly. These are the eligibility requirements to monetize the videos, your account must be in good standing, your videos should have been created according to the Adsense community guidelines, your age must be 18 or above to participate in Adsense publisher program. To start, go to channel features and status section. The page might look similar to the screenshot given below. Under features, the monetisation setting can be found. You have to enable this feature to display ads on the videos. 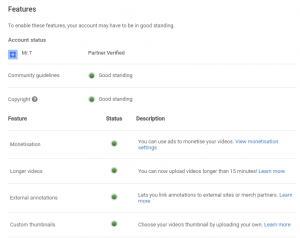 You must agree with the terms & conditions of the Youtube partner program to participate. After monetisation is enabled, the green light will be enabled on the monetisation status. You will receive an email to the corresponding email address regarding this. 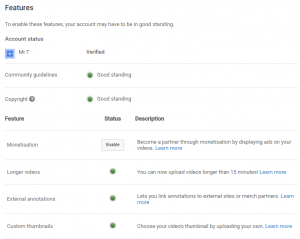 Then after you must start an Adsense account and link it with Youtube channel to complete the monetisation process. You can make use of this full guide about how to monetize Youtube videos with Adsense. Affiliate marketing is the advanced way to monetise the Youtube videos. Top YouTubers promote products & services on Youtube and earn the commission by giving a qualified lead/sale. To do affiliate marketing, you must be a blogger or top YouTuber. Not all the videos are can be used to do affiliate marketing. Affiliate marketers create videos reviewing/explaining the products or service and leave their affiliate link below the video on the description. When the visitors find the product or service useful, they might buy the product using the affiliate link. After successful purchase, the commission will be added to the affiliate account. Adsense + Affiliate marketing is one of the best ways to make money on Youtube. Selling health supplements, SEO services, online services, selling eBooks, selling software by reviewing them are few examples. To start affiliate marketing, you must become an affiliate of the affiliate network(s). Niche specific Youtube channels with huge traffic can monetize their videos with direct ads. Big companies pay these Youtubers for adding their video clip/content on the channel videos or description. Adding trailer(s) at the initial part of the movie review is the best example of direct advertising. Sponsoring the Youtuber for recommending the products, services, other Youtube videos at the end are the example of direct advertising/sponsored ads. Adding trailer of the new movie in the beginning/end of the movie review is a great example of direct advertising. Sponsoring the Youtuber for recommending the products, services, other Youtube videos at the end are the example of direct advertising/sponsored ads. Monetizing the Youtube videos with Adsense ads and the direct ads will multiply the income several times higher. Banner ads – Banner ads are the most common ad type displayed on the sidebar of all the pages when the videos are played. These are mostly 300 x 250 or 336 x 260 in size. Overlay ads – Overlay ads are banner ads displayed at the bottom of the screen when the videos are played. The most used sizes are 728 x 90 and 468 x 60. Video ads – Video ads will be played before the actual video starts playing. There are two types of video ads displayed which are skippable after 30 seconds and non-skippable. Video ads will be played only on channels with high traffic. Sponsored cards – In this type content relevant to the video will be displayed. To become a successful blogger, you must truly concentrate on creating quality content and growing the brand name of the channel. The step to the success can be analyzed by looking at the number of subscribers. So, ask your visitors to subscribe the channel at the end of each video. The more subscribers your channel get, the more times your videos will be viewed. When the videos are viewed by more visitors automatically it will start generating revenue. These are the basics to become a successful Youtuber.